Keep tempo without being click-stracted. 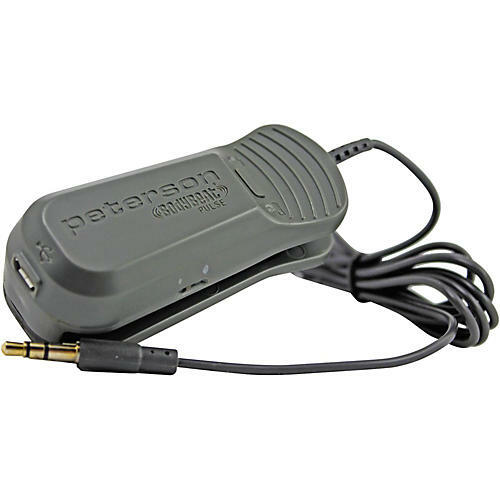 The Peterson BodyBeat Pulse Solo is a rechargeable active clip-on device that gives every electronic metronome the capability to silently convey tempo. Connect the standard 3.5 millimeter stereo plug into your metronome and you'll have a whole new level of functionality. The BodyBeat Pulse even works with metronome apps on mobile devices. Use the pulse with the Peterson BodyBeat Metronome App and you'll also feel three different levels of intensity for downbeats, accents and subdivisions. As any real musician knows, tempo should be "felt". The loud click of a metronome was never intended to accompany your music. The BodyBeat Pulse Solo lets you experience the freedom of playing to an exact tempo without your metronome playing with you. Since the introduction of Peterson vibe-clip technology, musicians all over the world are now experiencing a way to internalize tempo rather than merely playing along to a robotic wood block or cowbell. Peterson BodyBeat products provide a tactile pulse that can be felt but not heard, can be worn discreetly and allows your ears to focus on the music you're creating. Order this smarter, more discrete metronome today. Product Dimensions LxWxH: 1.25 x 1.25 x 3 in. Product Weight: 0.14 lb.